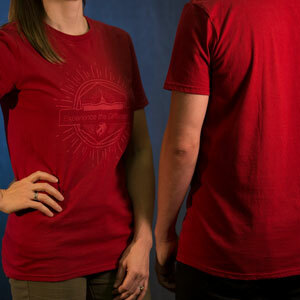 You can now purchase a variety of SBN Merchandise ONLINE, normally only available at JSM Campmeetings at www.shopjsm.org. "DON'T TRY TO CHANGE IT" bottom. 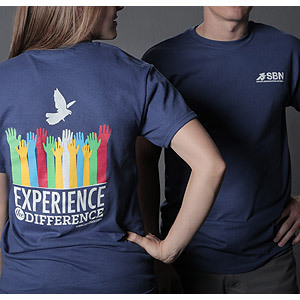 logo features a large globe on the back with the wording - "EXPERIENCE THE DIFFERENCE"
and a SBN logo on the front. 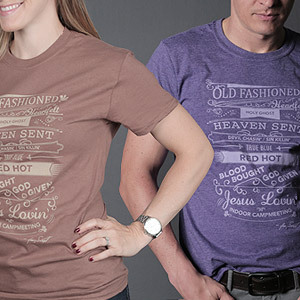 Purple T-Shirt with one of Brother Jimmy Swaggarts’ well-known sayings..."Old fashioned - Heartfelt - Holy Ghost - Devil Chasin' / Sin Killin' - True Blue - Red Hot - Blood Bought - God Given - Jesus Lovin' - Indoor Campmeting" and Jimmy Swaggart's signature. 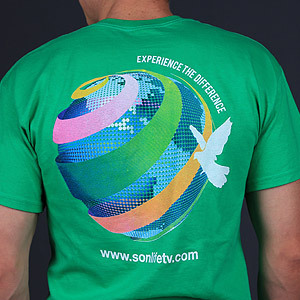 Anyone who has attended the crusades, campmeetings, or church services of Jimmy Swaggart Ministries—either in person, or through the SonLife Broadcasting Network—understands the phrase, “Experience the difference.” Now you can share this longtime ministry slogan printed on a high-quality, 100 percent cotton SBN t-shirt. Available in royal blue. 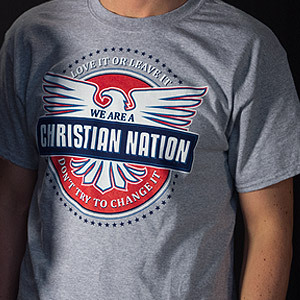 This beautifully designed t-shirt, imprinted with the image of Family Worship Center and the JSM logo, offers a subtle invitation to others to“Experience the Difference” for themselves. 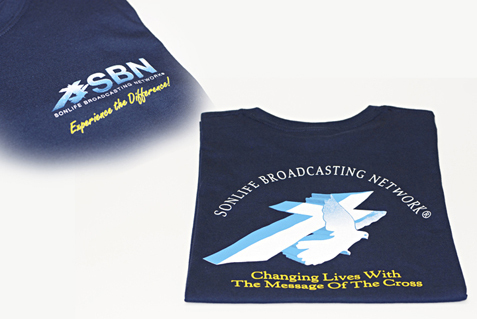 Navy Blue T-Shirt with the SBN Logo on the front with a larger graphic on the back reading - "SONLIFE BROADCASTING NETWORK" - "Changing Lives With The Message Of The Cross". I Corinthians 1:18 is a powerful verse of Scripture that turns alleyes—saved and unsaved—back to the Cross of Christ. Verse lettering intangerine and white on teal blue shirt. 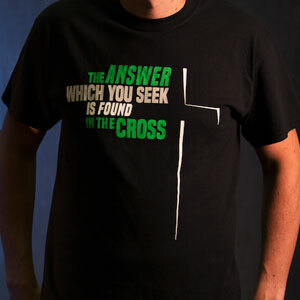 The Message of the Cross is the gospel of Jesus Christ and Him crucified and this shirt is a great way to share that message with those looking for answers. This t-shirt is black with green and white wording. 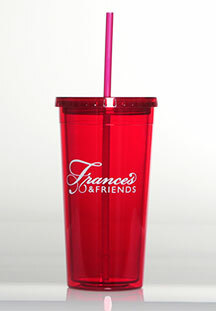 A 20oz acrylic, double wall insulated red tumbler with lid and straw, and "Frances & Friends" logo in white. 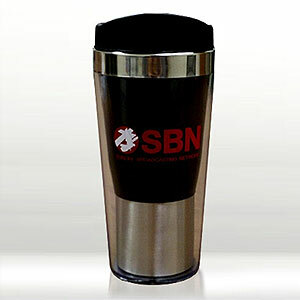 The SBN travel mug is here! 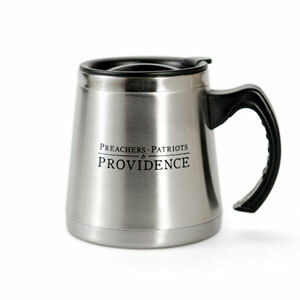 This attractive, 16-ounce tumbler will keep your coffee hot while you travel or relax at home. The screw-on lid guards against spills, and the slim design fits into most auto cup holders. For best care, hand washing is recommended. Not for use in microwaves. 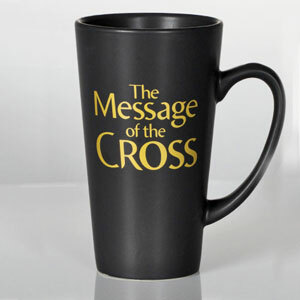 This handsome coffee mug can be a great conversation starter among family, friends, and coworkers about what the Message of the Cross means to you. Coffee mug holds up to 16 ounces. Available in black matte. Microwave safe; hand wash recommended. 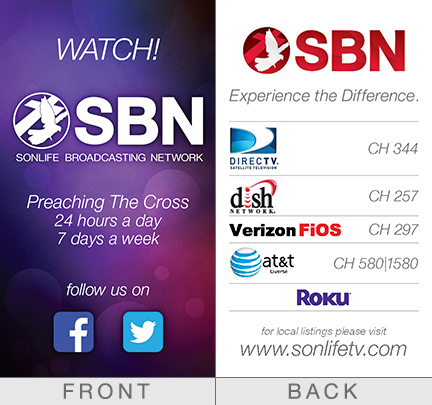 Looking for a way to let others know about the SonLife Broadcasting Network? Use this informational card to help spread the word. 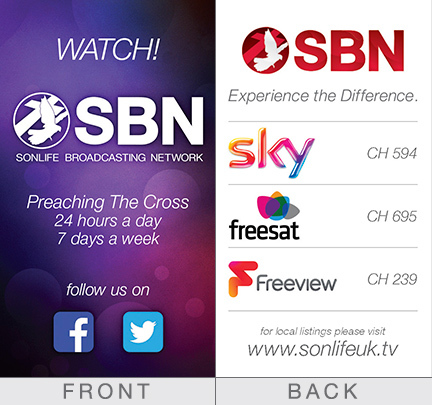 SBN cards are an easy way to share info quickly with others.